So you need a men's short sleeve t-shirt. Your favorite thing to do is search for new clothes, right? Sarcastic or not, it's going to be the experience to end all experiences. Okay, so we know searching for new men's workwear isn't a trip to a theme park, but you'r ... (see full details) (see specifications) #TB0A111WC77. So you need a men's short sleeve t-shirt. Your favorite thing to do is search for new clothes, right? Sarcastic or not, it's going to be the experience to end all experiences. Okay, so we know searching for new men's workwear isn't a trip to a theme park, but you're here because you have to get one. For work. For hiking. Or whatever the occasion that's presented itself. Men's tees may be ordinary, but the Timberland Pro Men's TB0A111WC77 Yellow Wicking Good Short Sleeve Shirt is anything but ordinary. This yellow Wicking Good shirt is the one that you'll go back to all the time, as it's loaded with features that you'll appreciate, including benefits that other short sleeve work shirts don't have. First of all, it's made of breathable, quick-drying fabric with odor-resistant and wicking technology. It's specifically designed to prevent odor-causing bacteria, so your men's work clothes will smell fresher for a long time. As long as we're discussing the breathable fabric, you should know that this short sleeve yellow shirt is made of a 4.5-ounce 100% polyester textured knit. This polyester is so smooth and feels great on your skin. (We may have tested out a few sample garments.) You want to be in comfortable, soft fabric. The Timberland Pro short sleeve shirt for men sure meets our standards for softness plus durability. It also features 3.4-ounce 100% polyester mesh side panels, which allows air to flow easily through this yellow moisture-wicking shirt, keeping you dry and comfortable. The moisture-wicking fabric wicks perspiration away from your skin, allowing you to remain dry and at ease as you work. Comfort is key here. 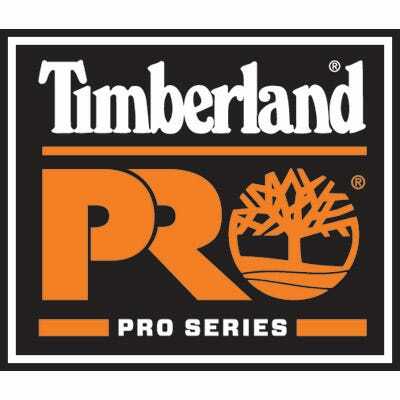 Timberland Pro has thought of everything. If you're out in the sun for hours at a time, you know how annoying and dangerous that can be. The last thing you want is to get sunburned, let alone while you're wearing a men's work shirt that should protect you from such things. Luckily, this Timberland Pro short sleeve shirt has built-in 50+ UPF protection. UPF stands for Ultraviolet Protection Factor, which measures how effective garments are in protecting your body from ultraviolet rays. This certainly helps protect your unblemished skin from sunburns, blocking up to 98% of the sun's rays from penetrating through the material. Think about those annoying neck tags that you find in all kinds of men's tee shirts. You know the ones. They scratch your skin, and they're just a nuisance to society. Or at least your neck. That's no longer a problem! This yellow work shirt features a tagless neck, so an annoying, abrasive tag scraping your neck is old news. And a men's work tee is even greater if it has safety features. Yes, this simple sweat-wicking short sleeve shirt even has a safety component. Its color, which is a bold yellow, enhances visibility, so people will see you easily on a job where dangers lurk. This wonderful Timberland Pro Men's TB0A111WC77 Yellow Wicking Good Short Sleeve Shirt is so straightforward in its presentation, but it's loaded with features you'll clamor for! Get yours ordered from Working Person's Store today. See? Finding new men's workwear wasn't so bad! Timberland Pro Shirt: Men's TB0A111WC77 Yellow Wicking Good Short Sleeve Shirt is being added to your cart.